Since 1960 Labour History Review has explored the working lives and politics of 'ordinary' people. It has played a key role in redefining social and political history. The journal's emphasis is on British labour history, though comparative and international studies are not neglected. 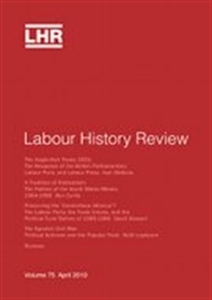 The editors welcome contributions which dig deeper within the traditional subject matter of labour history, but they are also keen to expand the parameters of the subject and the range of approaches taken to it. They are particularly interested in articles which engage with issues of gender and ethnicity or race, as well as class. From 2017 Liverpool University Press will charge additional fees for multi-site subscriptions. A multi-site subscription is defined as when a single institution wants to offer online access to its subscribed journals at more than one campus outside of the purchasing institution’s metropolitan boundary. Those institutions purchasing a new multi-site subscription from 2017 will pay an additional 50% of the subscription price for their tier, per campus outside of the purchasing institution's metropolitan boundary. If you would like to purchase a multi-site subscription for your institution please content Jennie Collinson, Head of Sales at Liverpool University Press, at j.collinson@liverpool.ac.uk.